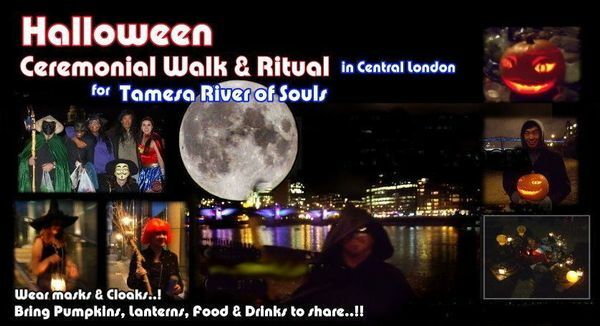 Halloween 2017 – Lantern-lit walk & Tamesa river of Souls Ritual by Thames (London 31Oct17) | QuantumPhoenix.net – Esoterica, Paganism & Ritual Magic. Join us on Halloween Night in Central London on Monday …31st October 2017.. We will be facilitating our annual `Thames: River of Souls / Samhain’ Ceremony to honour the Spirit of Thames & Ancestors. This time we will begin with a ceremonial procession along river Thames (from outside the Globe Theatre, and walk along bankside, past Tate Modern, Blackfriars Bridge, Oxo Tower, Gabriel’s Wharf, and end just outside National Theatre (the circular concrete `performance’ area along the riverside). We hope to do our ceremony in this space – subject to local circumstances / crowd etc. (or do ceremony nearby). This is the actual Halloween night.. In the midst of fun-people in London will be in fancy dress…So Wear Fancy dress…Masks.. Witchy Cloaks.. Wizard attire.. Ghostly look…Werewolves & Vampires welcome! Bring your carved Pumpkins… Lanterns with light or candle in it..! Our ceremonies are open to everyone, of all paths and religions. Bring some easy snacks & drinks to share..for the `Feasting with Death’ (tradition at Samhain). Stay as long as you like.. and leave when you want to. We will be gathering outside the Shakespeare’s Globe Theatre (riverside gate) / Bankside Pier area at 7.30pm. After designating ritual roles, getting our lanterns & costumes setup, we’ll begin a slow and social walk along bankside..
We’ll be walking along south bank riverside walk… from Globe Theatre, past Millennium bridge (south side), Tate Modern Gallery, Blackfriars overground station / bridge, Oxo Tower, Gabriel’s Wharf, and finally end just outside National Theatre. 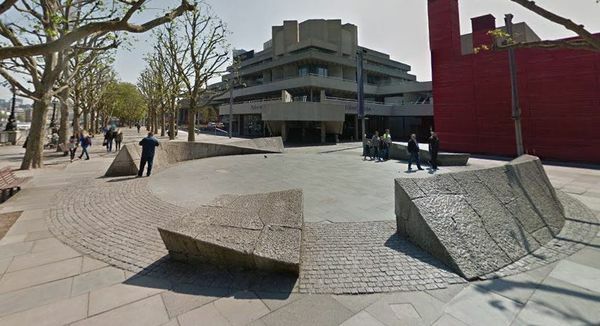 Our Halloween ceremony is expected to be held in the open public circular concrete `performance’ area along the riverside (see photo attached)- this is subject to local circumstances, other crowd etc.If it’s not possible there, we’ll be nearby so keep an eye out. Please get to outside steps of Shakespear’s Globe Theatre / Bankside pier by 7.30pm. We’ll get organised and begin walk at 8pm. We hope the 1000m walk will only take us about 1 hour at an extremely leisurely procession/ festive walking speed. 🙂 So we’ll be gathering outside the National Theatre area (end of walk) by 9pm..and do a short Samhain ritual by about 9.15pm. Then we’ll continue socialising. Due to the public space, the ritual team will be organised in advance ..so we can arrive at end point and perform the ritual without much fuss. There is bound to be general public watching.. so we’ll be asking experienced ritualists to help in advance ( 1 week before) to volunteer for parts and get ritual prepared.. and be in costume../ masks. -Wear warm/ waterproof comfortable cloths… Please check weather for London for friday evening and dress appropriate. Wear good footwear..as standing/ walking for longer duration can get hard on the feet. -Please bring small picnic-style food and drinks to share. -Bring things for self.. and if feeling generous, something to share with others..
Safety notes: Everyone is asked to take extra care with their own personal safety as we’ll be in a busy public place. Keep valuables with you at all times.. or with a trusted friend who is not playing a big role in ritual. beware of thieves/ pickpockets, any silly protesters (who don’t like pagans) and may try to cause a wrangle. If this happens..just step away from it.. do not be baited.. and just get out asap…and get far away to a safer place. No swords…no athames..or other `real’ weapons – or anything that might alarm the general public /police. We play safe and nice.. And you are responsible for your own good behaviour and health & safety! !